this simple bar uses a small niche close to other plumbing rough-ins to save money. Planning a home remodeling project is exciting! We all want to create our perfect dream space. Whether it's that chef's kitchen you've always dreamt about, the media room in the attic where the family can all gather and enjoy movie night, or that spa-like master bath you've always wanted, your only limit is your creative vision and of course your budget! While we all wish that money was no object and we could have the perfect space, the reality is that we're limited by our budget. Working with a talented design-build-remodeling firm can help you to stretch your budget to get many of the dream features you're looking for. The secret is knowing where to save and where to splurge. A reputable design-build-remodeling firm can help you when it comes to materials and fixtures. They can also suggest simple design changes that can result in stretching your budget so you can splurge for that professional chef's stove or jacuzzi soaking tub. Let's take a look at some different areas of your design where simple changes can stretch your budget, and where to save and where to splurge. There are many ways your builder can work with you on your design to help you save money for those must-have purchases. Here are three ideas that can free up funds. When remodeling this bathroom, all plumbing rough-ins remained in the same location. The shower was enlarged slightly but kept the same drain. An outdated jetted tub was removed so that a second vanity could be installed next to the window, but it used the same plumbing rough-ins. 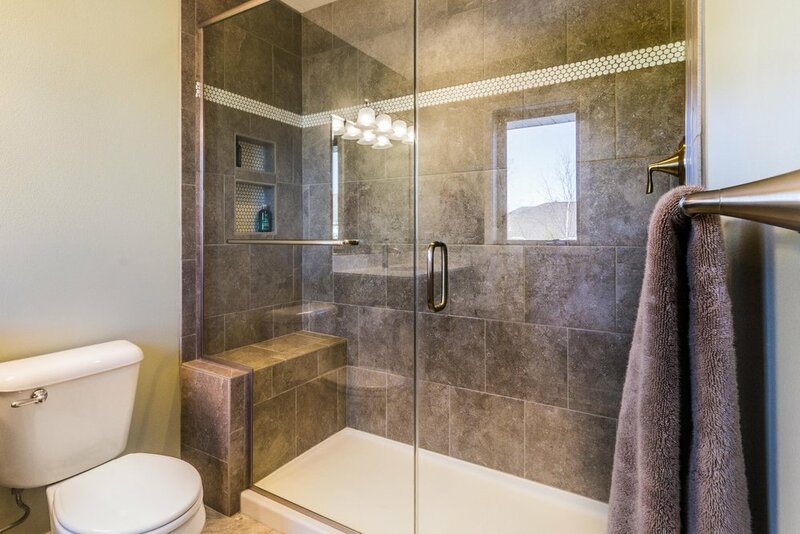 This saved money in the construction process and allowed our clients to continue remodeling other areas of the house in addition to the bathroom. An inexpensive prefabricated white shower base was used in this shower in order to save money. The design integrates with the floor choice, toilet color, and most importantly the penny round tile trim strip, to make this a beautiful and cohesive design. When considering a bathroom or kitchen remodel, it's easy to envision a completely different layout. If you have the budget, you can do it. If not, or if your bathroom or kitchen layout works, consider leaving fixtures where they are and just replacing them. This can save a ton of time and money on plumbing and electrical work. If everything is up to code, leave it where it is and replace the fixtures. The money you save can be put towards upgrading to a new smart toilet or a jacuzzi tub. You may be considering a new tub and sink, but first, take a close look at what you have. While it's tempting to rip everything out and start over, maybe a simple refresh may be enough. Chips or dings in the tub can be easily fixed. The same approach can be taken in the kitchen. If you have high-quality cabinets, updating them with a coat of paint, new hardware and maybe a different door style, or glass front cabinet doors can make a big difference, and save you plenty. A functional aesthetically pleasing kitchen counter doesn't have to cost a fortune. Instead of splurging on granite or marble, consider a man-made surface. Today countertop technology has given us materials that perfectly mimic natural materials at a much lower cost. Splurge on an exotic backsplash to add some visual focus, and take your significant other out to a fancy dinner with the money you'll save! These are just three simple adjustments that can save you plenty of time and money, while still giving you an updated modern look. If compromising on your design isn't an option, or you'd like to take the bathroom down to the studs and start over, consider where you allocate your budget. Here are some ideas. When it comes to home remodeling projects, kitchens and bathroom are the number one and two choices for most homeowners. In both of these rooms, there are ways to reallocate your budget to allow for some splurge items. First, assess your lifestyle and define your needs. For example, if you have young kids a white marble countertop might not be the best choice. Consider a natural marble pattern quartz. It's more durable and stain resistant, but still offers the aesthetic look of marble at a much lower cost. If you're considering an addition to add floor space, converting a garage or attic might be a more economical choice than expanding the envelope of your building. Much of the infrastructure like wiring and in the case of a garage, the slab is already in place. This can significantly cut the cost of your project. Choosing materials is an important aspect of saving for your project. For example, hardwood flooring can be expensive. By using new materials like wood grain porcelain tile, you can get almost the same look at a much lower price. Plus porcelain is easy to maintain and durable. One place to never cut corners is on your team. Working with a professional designer or design-build-remodeling firm is a smart investment that will always pay off. A good firm will always have your best interests in mind when designing your space. They will examine your lifestyle, your needs, and your wants and work with you to suggest materials that will meet your aesthetic needs while staying within your budget. They can recycle existing elements of your home, for example, refinishing your hardwood floor as opposed to replacing it, or refinishing your solid wood cabinets so that you can afford that 36” professional Viking Stove you've always wanted. A home remodeling can give your space a dramatic new look, expand your living space and add value to your home. The worst thing you can do is cut corners. That can create problems that can be expensive to fix in the future. There are always ways to cut costs regarding materials, and finishes while still maintaining the highest quality workmanship. The smartest investment you can make is working with a professional who is going to get it right the first time. If you live in Greater Madison, Wis. and have a home remodeling project you are contemplating and would like to speak with a design-build-remodeler, we want to hear from you. Click here to schedule an appointment.